Robbie Smith is a true performer in every sense of the word. His trumpet playing has an exquisite quality and unique style, which will leave you wanting more! He toured the world with Blues Diva Candye Kane and was a key performer in the United by Music tour with Candye Kane and Friends. Robbie's musicality is top-notch and so diverse he's played with a variety of Blues Bands, Swing Bands, Big Bands, Jazz Ensembles, and Top 40s Groups. 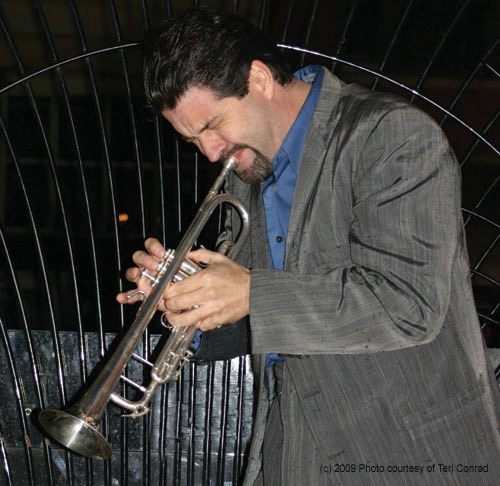 Robbie takes inspiration from the most prominent of trumpet influences, such as Doc Severinsen, Chet Baker, Clifford Brown, and Maynard Ferguson and blends them with the stylistic influences of Louis Prima, Louis Jordan and Wynonie Harris. A Southern California native, Robbie Makes his home in Escondido in San Diego county and gigs steadily in the Los Angeles and San Diego areas. You can find him performing with the Wayne Foster Entertainment Group, Jack Wheaton from Stan Kenton , Candye Kane, Sue Palmer, Blue Largo, Taryn Donath, Big Band Express, The Players, The Modern Jazz Majestics, Jonny Viau and the Blues Allstars, Johnny B. and others. Robbie has also made special guest appearances at the annual CHOC Motorcycle Ride with 2000 Lbs of Blues. His sound is pure, simple and perfectly executed! *BEST PRICES* New Student Brass Instruments! Please Visit My Store: CLICK HERE!